Last year, my 2017 Garden Soil Test Report, discussed in Jim’s Garden Adventure 2017 Chapter 1 “Beginnings”, showed my garden potassium (K) was a bit low and the pH was way too low. 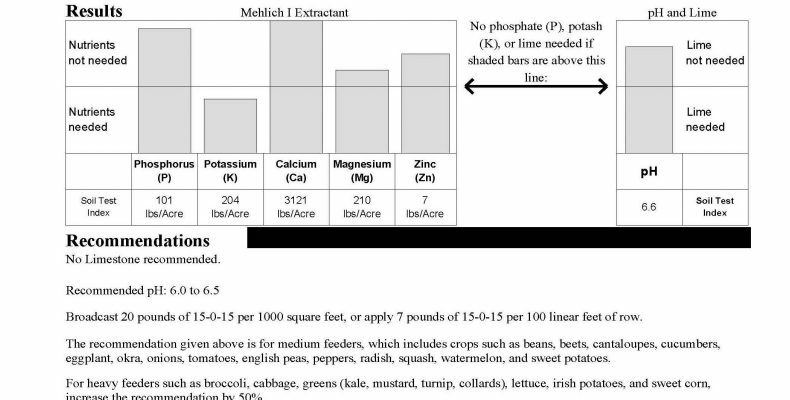 The recommendations of my local county agricultural extension were to increase the potassium nutrient level at a rate of 20 pounds per 1,000 square feet. 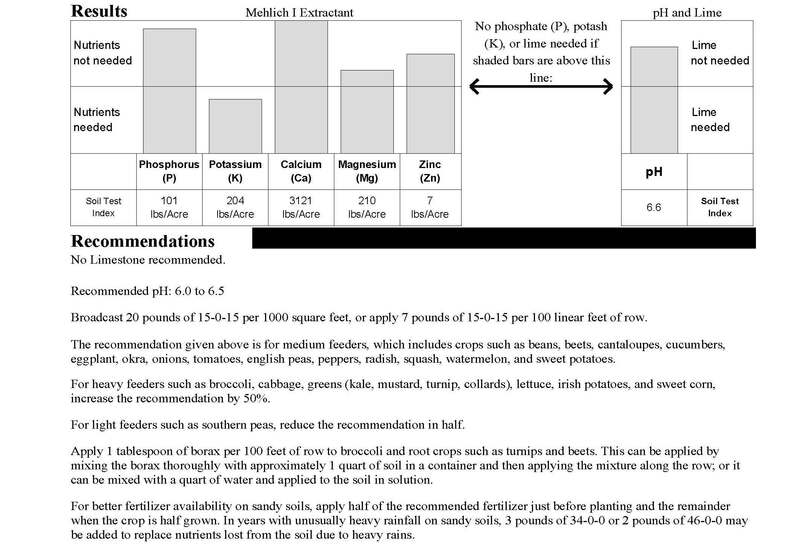 They also said to add 65 pounds of limestone per 1000 square feet to get my garden’s pH into the recommended zone for vegetable gardens. My garden size is about 2,400 square feet. Thus, I added 50 pounds of 16-4-8 fertilizer and 150 pounds of dolomite limestone – which took a serious drain on my garden amendments budget. But, it had to be done. It took about 10 days to receive my soil test this year. I was most pleasantly surprised to see that my soil pH was completely acceptable – meaning, I didn’t need to add a load of limestone to my garden. That in itself saved me a lot of time and money over last year’s results. I attribute this year’s results to all the mulching and composting done last year that has continually improved the soil and kept the pH level where it needed to be. The potassium (K) level was higher than last year but, still a bit low. 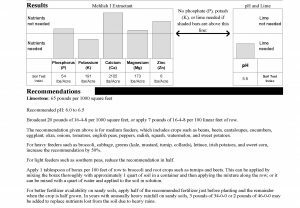 My local county agricultural extension suggested adding 20 pounds of 15-0-15 fertilizer per 1,000 square feet – which, for my garden equates to about 50 pounds evenly distributed. As luck would have it, I had just purchased a bag of Lesco 24-0-11 that I originally planned on applying to my lawn but, at the last minute, I changed to another lawn fertilizer. So – this was perfect timing. The 24-0-11 was close enough to the soil test counseling since it would also boost the potassium while adding nitrogen (N) to my garden. As you can see, adding soil amendments doesn’t have to be an exact science. Getting the numbers close is fine and dandy. I just made sure that the middle number was “0” since I was topping out on phosphorus (P) already. My garden doesn’t need absolute perfection – just plenty of attention. Getting out my trusty Scott’s Broadcast Spreader, I headed for the garden to evenly distribute the fertilizer over my soon-to-be 2018 backyard home garden. Since I had to put the entire 50 pounds of fertilizer evenly over the garden soil, I started out at a “6” setting and made my first pass. Seeing that I hadn’t even used 20 pounds of fertilizer, I increased the broadcast spreader to a “7.5” setting. This worked well and, by the end of the second pass, I was able to spread the remaining 30 pounds of fertilizer across the garden area. The job was completed in less than half an hour! So, I had time to daydream a little – thinking about what I would plant this year and where I would put it. Rain is forecasted in the next couple of days and that will help the fertilizer become one with the soil. Not long ago, I visited a local farmer and got a trailer load of manure to fertilize my strawberry patch. I told him it was fertilizer. 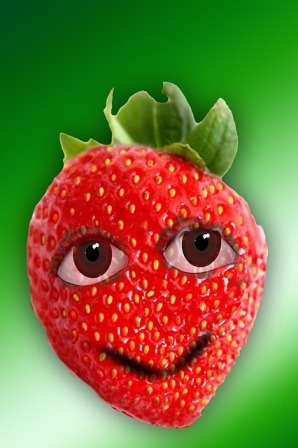 Yep – I’m sure that strawberries taste much better that way. Are you doing your due diligence and getting your soil test this year? Let me know your results in the comments below or by email, jim@perfect-vegetable-garden.com. I don’t fully understand everything you said, but I am just learning about the soil. I usually just do containers. Your article was interesting. Where do you go to get your soil tested like that?? I recently moved into a place and one part of the yard is overrun with blackberries. I tried to dig, but the soil is so hard, even with weeks of rain that I am at a loss and was going to see about testing to find out what it is and if it’s worth trying to use or just going with container gardening. Every county in every state has a “county agricultural extension” office. They offer both free and “paid for” classes on a variety of agricultural subjects including growing vegetables and fruits, pests and diseases, soil amendments, home gardening, commercial farming, livestock care, etc. The extension offices usually work with a local university to offer soil testing for both home gardeners and commercial farmers. That will put you in contact with your local county government agricultural support folks and, they can give you their procedures for submitting a soil test. Usually a good quality tiller can chew up even the hardest soil if you follow my tiller techniques. Take a look at my pages on electric tillers or gas tillers for some great advice on which ones may suit your needs. But, if all else fails, you always have container gardening for a backup. Just make sure your plants get at least 6 to 8 hours of sun every day. You may want to check out my page that explains soil testing. If you have any additional questions, reply in the comments or email me, jim@perfect-vegetable-garden.com. Hello again, another quick question. I was looking around your site like you suggested, tiller options are great, but I do have lots of trees, so I am not sure about that much sun a day over there. I am worried about the blackberries that grow wild over there, I have heard it is hard to get rid of them and tilling will just put them throughout where I work. chemicals would destroy the soil, any ideas what can be done to get rid of them?? I am building a retaining wall in some areas, but they overrun the grass area and pop up in new places. Have you ever tried to eradicate kudzu? It is much harder to get rid of blackberries. They can propagate by dropping seeds from their fruit, by re-rooting through stems that touch the ground, from the root ball underground, and from stems that actually travel underground, called rhizomes. These rhizomes will actually produce both shoots and additional root balls sporadically throughout the area. That is why one small blackberry bush can become a monster Godzilla in a short couple of years. Identify and mark the location of all blackberry bushes. Cut off everything above the surface and place everything in a plastic garbage bag. Do NOT leave any fruit or stems on the ground. Collect everything, bag it, and toss it in the trash. Carefully and gently loosen the dirt around the roots and root ball below the surface. Make believe you are an archaeologist and that the roots and root ball are precious finds that must remain intact. Slowly remove as much as you can, put it in a bag, and toss it in the trash. If you’re lucky, you may even find sections of rhizomes and you can pull them out as well. Till the area thoroughly. Do this once a week. If you see any blackberry sprouts, pull them up roots and all and till again. When you don’t have time to till, at least keep the area mowed down to the nubs. Keep tilling and/or mowing…FOREVER…and then some. In a couple of years, you have a 75% chance that the blackberries will be completely gone…as long as you did the same thing to every single blackberry bush in your area.